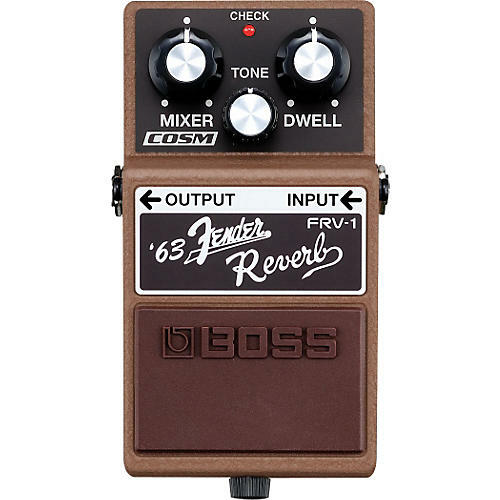 BOSS and Fender USA have collaborated to create the BOSS FRV-1 pedal, a stunning recreation of the legendary '63 Fender Reverb via COSM technology. The FRV-1 puts that timeless tube-driven reverb sound under your foot in a tough, reliable compact reverb pedal. The Fender Spring Reverb is the sound that launched the surf-music phenomenon, and is a staple of rockabilly, country, and blues. Later, it became commonplace in grunge and other modern genres. Now the same legendary sound can be had in an affordable, rugged compact guitar effect pedal. Expected battery life under continuous use: Alkaline: 10.5 hours. These figures will vary depending on the actual conditions of use.